Fr. Dustin Boehm – Click here to make an appointment to meet with Fr. Dustin. I was Baptized on September 25, 1983 at Holy Name Catholic Church in Beech Grove, IN. Thanks to my parents and our Lord, that day was and remains the most important day of my life. I grew up on the Southside of Indianapolis where I attended Our Lady of the Greenwood Parish and School as well as Roncalli High School. Next, I entered St. John Vianney College Seminary in St. Paul, MN. Upon graduation in 2006, I went to St. Meinrad Seminary and School of Theology until the Spring of 2011. 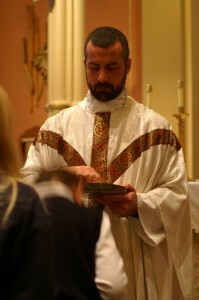 After nine years in seminary, I was finally ordained a priest on June 4, 2011. I began my priestly ministry as Associate Pastor at St. Monica Church and chaplain at Cardinal Ritter High School until 2014. In July of that year, I arrived at what is now home: Saints Gabriel and Bridget Parishes.